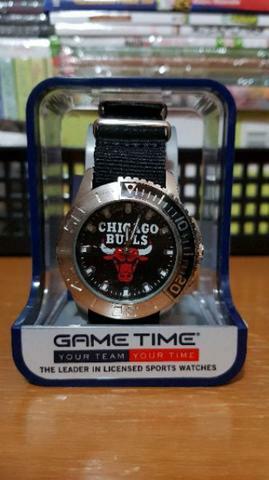 WTS Jam Tangan Nba GameTime Chicago Bulls. ORI from USA, orderan dari website LIDS•com (ada juga di teamstore•com / fanatics). Game Time Men's Starter Quartz Wrist Watch, Model NBA-STA-CHI. - High quality officially licensed Game Time Starter Series wrist watch. -Officially Licensed Team Logo and Colors. - Black Nylon Strap fits wrists sizes from 7.8" to 9.25". - Japan Quartz Movement and is water resistant to 3 ATM or about 99'. - Case size: 42 mm or 1.65"
- Case has a scratch resistant mineral crystal. New. dibuka dari kardus boxnya untuk pengecekan aja. Minat bisa contact saya di 081213897041. Ekslusif terutama buat fans Chicago Bulls ! cod bisa after office hour / weekend di medit 1 tanjung duren atau mall Central Park.